The creative beauty of Naked Doors is astounding. With the opportunity to take any existing kitchen and complete update and transform it with new doors and minimal renovation or hassle, Naked Doors is the smart way to update your kitchen. Creating an entire new set of doors for an existing kitchen within our showroom, we completely updated and transformed the kitchen without having to undergo a full renovation. With new colours chosen, and beautiful bespoke details added to the doors, the Albert Bridge kitchen was created. The Albert Bridge Kitchen is inspired very much by its namesake. We are always inspired by our surroundings and London architecture, and after seeing the bridge in all its glory in London one day, we knew we needed to bring a part of this to Norfolk. 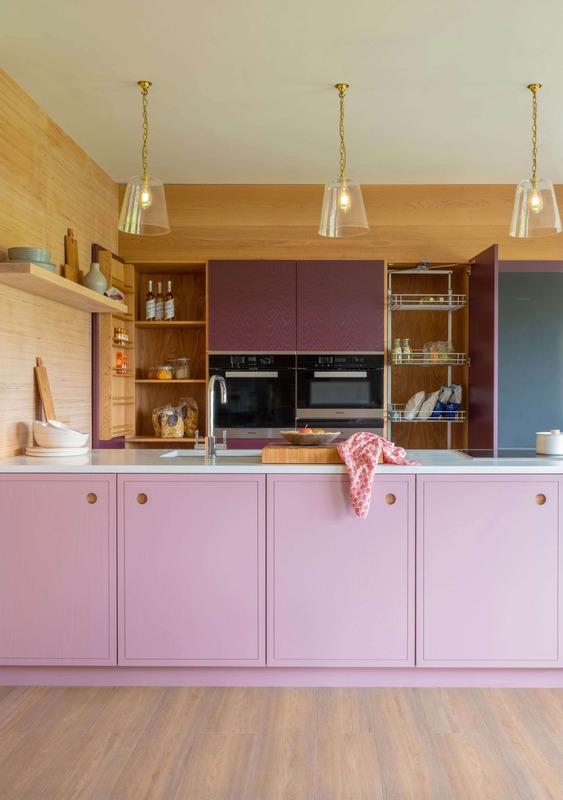 Pink is not a colour that's often used within a kitchen, as it's often reserved for a bedroom, but we love how cosy and comfortable this instantly makes a room feel. By adding the richer tones of Brinjal, it adds even more depth and dimension to the room. As the heart of the home, the kitchen is the room that you often spend the most time in, so it is vital that you make it as comfortable as possible. We love the combination of these colours and how perfectly it works with the beautiful white quartz and sleek appliances. 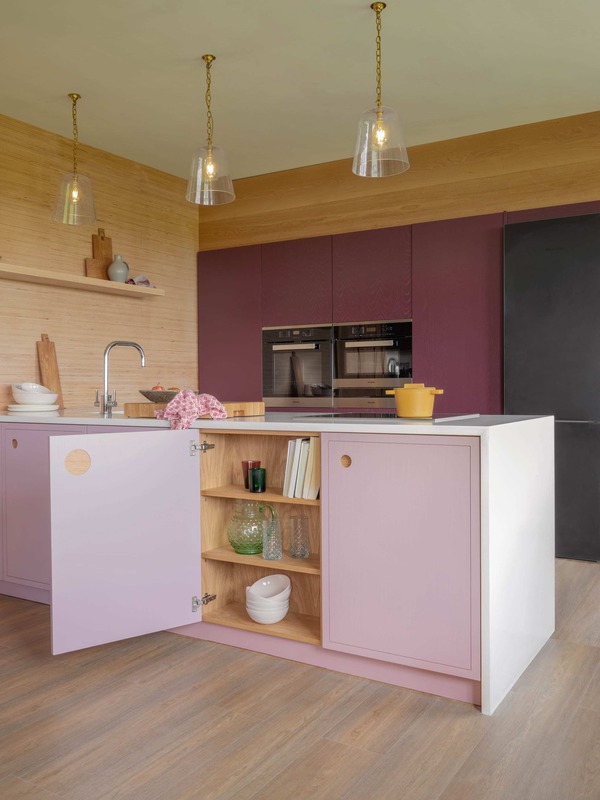 Our incredibly cool Ladbroke handle detail is the perfect choice for this compact kitchen, as it adds such a contemporary vibe to this incredibly on trend kitchen. 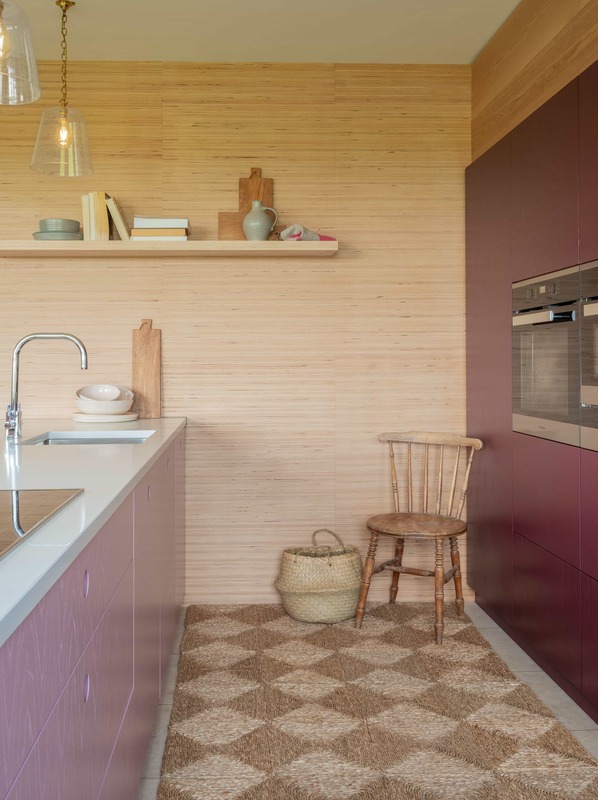 Combined with the beautiful ply panelling on the wall, this kitchen has an incredible natural beauty. We love using lots of exposed timber within our kitchens, as this is a material that needs no enhancing as it naturally looks so good. We used oak within the backings of the Ladbroke handle detail to ensure there was symmetry throughout the room. We wanted to show that with Naked Doors, you can easily create a trend-led kitchen. 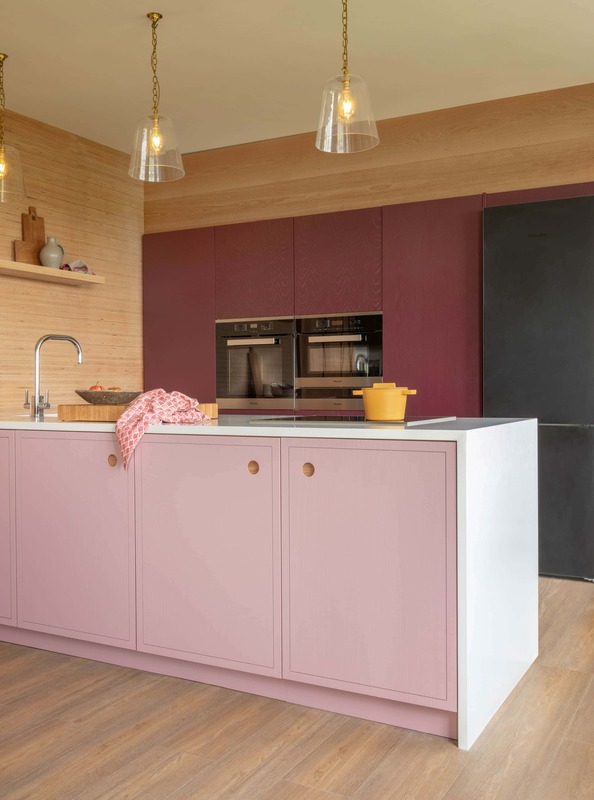 Naked Doors premise is to help you create the kitchen you have always dreamed of, but without the large budget that you need for so many companies on the high street. Our doors are the perfect way to achieve the look of a Naked Kitchen, but without having to fully renovate your whole room. Our doors are all completely bespoke and manufactured to any size you may need. Finished in any colour of your choice using our colour match service, or in several different exposed timber finishes. We always use the highest quality materials and offer the chance for the grain to remain visible, or for a flat finish, both of which look incredible with all paint colours.